The Radical Intel bowling ball can make any bowler look smart. 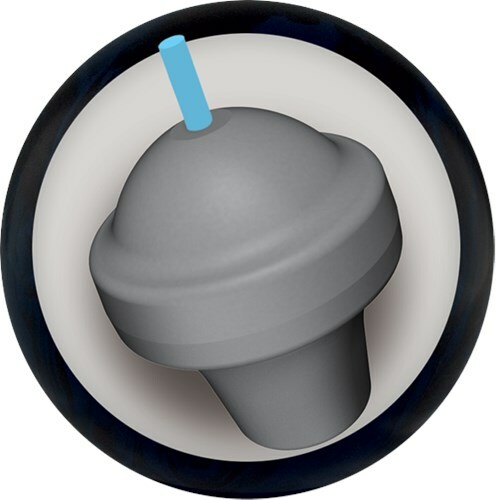 This ball combines a low differential symmetric core with the Ai 25 coverstock. This ball plays smart on tough patterns by being strong enough to open up the lanes but still smooth enough down lane so that it can be used on typical house shots as well as on the burn for tournament bowlers. This ball offers predictable ball motion and awesome usability from several angles on oily lane conditions. Similar Balls: Same Hook Potential, Lane Conditions & Coverstock as the Radical Intel. Radical Intel should be in your bag ... period! My first encounter with the Radical Intel was during a ball demo. I threw it on a 40' THS and it moved a little. I thought "why do they believe this is a benchmark ball?" Then I decided to slow my roll and bring the speed down just a few mph and OMG!! This ball is simply amazing! Extremely controllable and predictable. With different hand positions, I was able to control the breakpoint and still get good continuation through the pins. So I had one punched up with the pin just over the middle finger and applied the new USBC specification using approximately 2 oz of side with no extra holes. While utilizing my 5'clock hand position, I averaged 229.5 for 6 games. What I truly like about the Intel is how super smooth and strong it is with its ability to blend the oil line and not overreact off the dry. It has about a 10-15 board range which is perfect for sport conditions as well as THS. So if you're looking for a ball to hook more, then check out the Radical's Katana line which is design for 15+ range. But if you're looking for a benchmark, this is truly the only one IMHO. My next Intel will be pin down. I'm a left hander. Ball speed 14.5 mph. Rev rate 275. I drilled up my second Intel. The layout I choose to go with is 45 x 5 x 70. With this layout I get more flare. So it hooks sooner than the other intel. I can say this layout complements my other intel. This layout works well on the fresh. It's the first ball out of the bag. The Intel that YOU need! Because of my low tilt, Mo Pinel gave me the above layout that would be "houseshot friendly" and controllable off the friction. The INTEL is a symmetric solid and comes out of the box surfaced at 500, 1000, 2000. The ball is very, very smooth for me, and makes a nice controlled arc to the pocket. This ball takes very well to surface changes and can be used on a wide variety of conditions. This ball is worthy of having multiples and for some, will be the first ball out of the bag. I also have a Katana that is drilled the same way, and when the Katana has issues turning the corner, I can go to the Intel with confidence and strike at will on the exact same line. For anyone that has thrown Radical equipment before, this ball reminds me LOT of the V2 Solid. It is very rolly and controllable. It was said to have Rack Attack Grape solid tendencies, meaning that it's smooth off the breakpoint, which is true but the INTEL is at least 5 and 3 stronger than my Rack Attack drilled similarly. 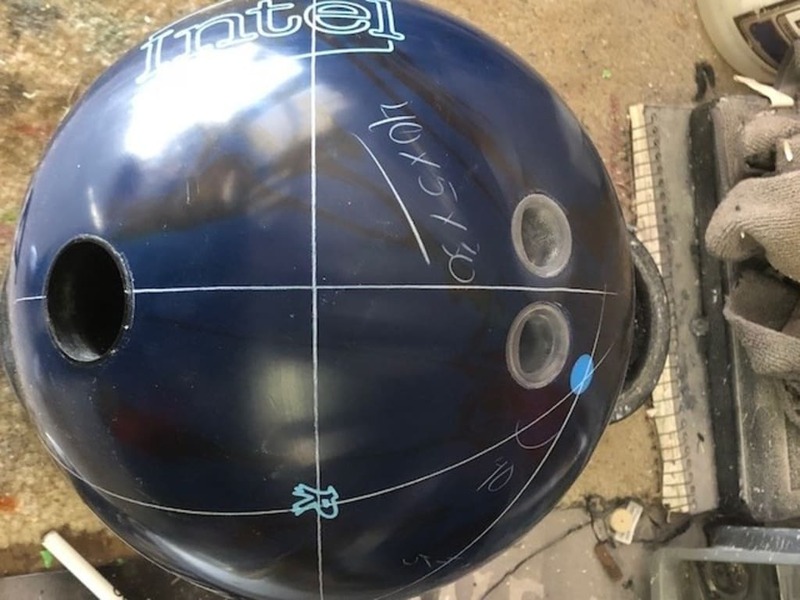 If you have every wanted to try Radical and not sure what to buy, this is a very, VERY safe bet and has a ball reaction that is useful for every type of bowler, regardless of style of delivery or rev rate. I am Jai Jones and I approve this message. I was surprised by how strong this ball was out of the box. I drilled it 40x5x30 And Started out playing 15 out to 7 and the ball still had more. I was able to move my feel 3 boards left and still get to the pocket. This ball has quickly became my favorite. With the symetrical core the ball is very smooth and not jumpy off the spot. I would highly recommend this ball to anyone. By Millerlite from Quebec, Qc. The Intel is a much awaited piece in the Radical lineup. The main goal of the Intel is to have a ball for the tougher oil patterns, where other balls will read too early or have the "hockey stick" type of hook, the Intel is smooth yet packs up a ton of punch for the price (Reliable line). I got to test this ball last week on the Beijing 39' pattern. This pattern is very speed sensitive, and requires premium shot making. I drilled my Intel 50x4.5x35. I am rev/speed matched, this ball was a lot stronger than I thought. Compared to my magnitude 035, I was 5 left and 2 inside with my eyes. The hitting power of this ball is excellent, great continuation. The ball is a little stronger than my Jackpot solid. The Intel should be in every tournament players bag, and is a great choice for Lihue players looking for a ball that will give them control without sacrificing hitting power. 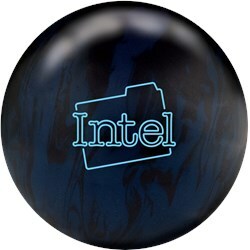 The Radical Intel is the perfect benchmark ball. With its lower flaring core and smooth rolling cover, the ball motion of the Intel is very predicatable with an easy to control breakpoint. The Intel is very continuous and hits like a truck. I went with one of my favorite symmetric layouts which puts the pin above the bridge and the CG about 3/4" of the centerline to allow for a balance hole if desired. This is the first ball out of the bag for me and often stays on the rack most of the night. Due to the time it takes to produce the Radical Intel ball it will ship in immediately. We cannot ship this ball outside the United States.